Flavour colour coded bags, a smattering of Crisps, an ingredients identifier, a big descriptive box etc., blah, blah. Standard and dull stuff. 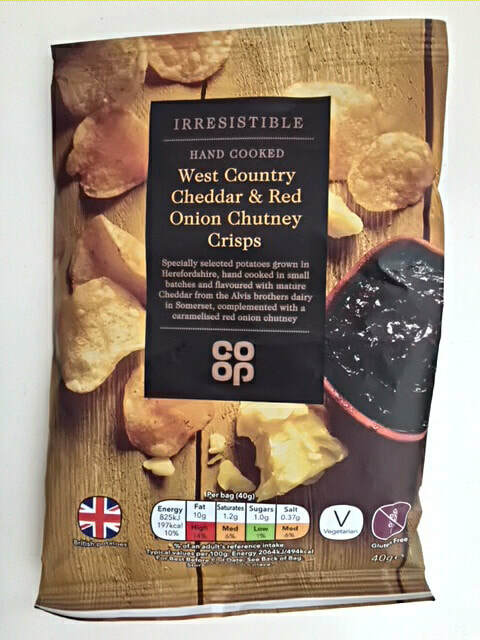 As with many Hand Cooked Crisps, these featured a firm and maybe even hard, Crunch. They never turned to mush at any stage, but instead mulched up like a crisps walk through Autumnal leaves. These Crisps had a high standard of bends, curls and gnarls. There was a heavy presence of crusty i blisters, and they thickly cut. The Cheese was instantly apparent and there was a mild sweetness in partnership. It is hard to say it was Red Chutney, but it complimented the min flavour very well, there was even a tangy Onion laced within it. A very impressive offering, far better than its supermarket branding.